Hot Tub Time Machine: Well, in all fairness, it is called Hot Tub Time Machine, so it was probably a little unreasonable of me to expect something a little smarter and little less, y'know, piss-stained. Still, there are big laughs here, and the film finally gives the great Craig Robinson the proper platform for his distinct and uproarious style of comedy. 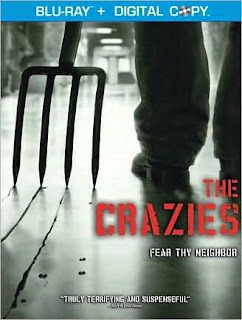 The Crazies (2010): Yes, we're all tired of horror remakes. But this one is smooth, professional, and frightening--and it offers the chance to draw some interesting parallels between its story and the current anti-government paranoia that's running rampant throughout the land. Don McKay: I don't know what the hell kind of movie they were making here, and I'm dubious that anyone involved can tell you either. But it certainly keeps your interest, for whatever that's worth. Creation: Some of it is arid dry, but this Charles Darwin biopic is a smart and honorable film about an important and, strangely, timely subject. On DVD: "Mystery Science Theater XVIII"
On DVD: "Hot Tub Time Machine"
On DVD: "The White Ribbon"